Try a little thought experiment. In one column, write down everything you want in an audio interface. You probably come up with things like physical controls, proper meters so you can see levels, and lots of ins and outs (including digital and MIDI). There are interfaces that will satisfy the whole wish list of the first category. But very often, they come in a big, hulking rack-mount case – actually perfectly ideal for dedicated studios or people who tour with a truck, but not so great for home studios or people who tour in a backpack. That’s why Track16 from MOTU finally looks worth noticing. With so many audio interfaces fairly similar, this one really is an uncommon combination of almost every feature you’d want with a small design. Looks-wise, it bears an unmistakable similarity to Apogee’s Duet – which, at least in the Duet2 revision, recently added meters and some I/O. And, for some people with simple recording and I/O needs, the Duet2 will be just fine. But as far as Track16’s specs, it’s like someone wrote down a wish list of everything you’d ever try to get out of an interface. 16 ins, 14 outs total (including the digital I/O, of course). Four main outputs – and the two main outs are balanced. Set up a separate monitoring pair, quad sound, whatever. Push-button access to inputs. I like this feature on the Propellerhead Balance – now you get it with a more generous I/O setup. Mac OS X, Windows 7 support, WDM, ASIO, Core Audio, Lion, etc. If you don’t like the spaghetti of breakout cables, you have the option of a breakout box, pictured below. You also get some extras – analysis tools and oscilloscope, tuner, DSP-based mixing with modeled EQ, reverb, compression. In other words, it can double as a mixer without having to lug additional gear. There’s even support for wireless control via TouchOSC on an iPad. It’s a niche question, but some readers have complained about the lack of Linux support, to which I say, MOTU, if you can spare one test unit, I can even give you the names of people who would write drivers. And there’s a precedent for doing such things without taking on an additional support burden. 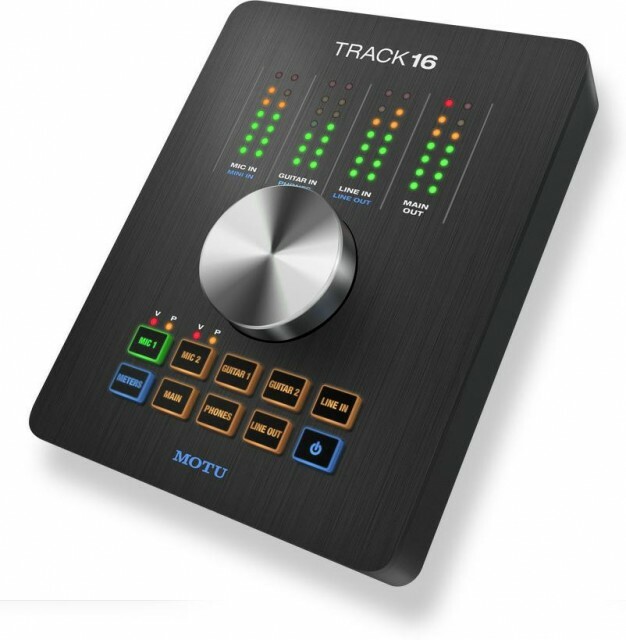 The Track16 looks more like the Apogee, but the closest competition feature-wise is clearly the RME Babyface. And yes, we’ll have to line up the three of them and compare soon. 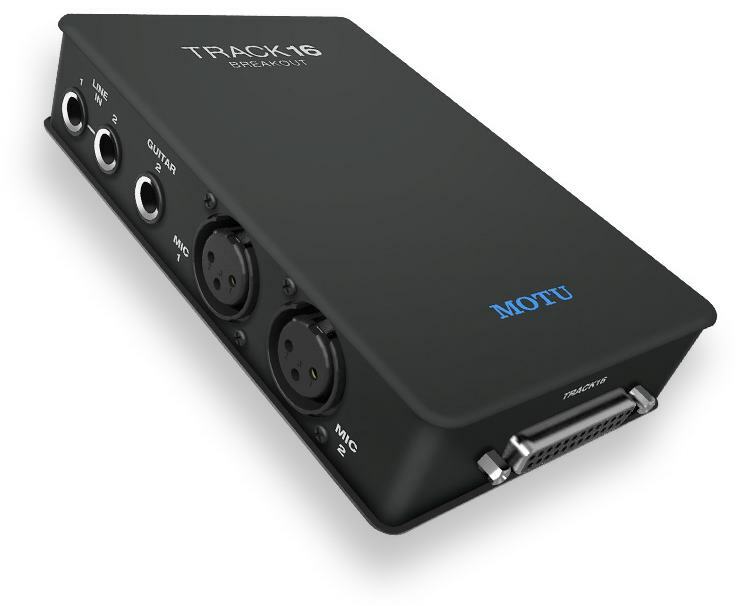 Track16 has the same guts as a MOTU UltraLite-mk3 or 828mk3, so it has all the usual CueMix FX features, including reverb and the LA-2A modeling. There have been some questions about drivers, latency, etc. on the forums, so the answer is: expect the same performance as our current line of mk3 hybrid interfaces. The top row of buttons are inputs. The bottom row are outputs. Press the button corresponding to the input or output you want to control. OK, that’s all pretty obvious. For inputs, you are controlling input trim. For outputs, volume. However, you can also control CueMix bus input level by pressing both the input and the desired output bus. For example, if you want to control the mix bus volume for the 2nd guitar input for the line outputs mix bus, press GUITAR 2 and LINE OUT. They both highlight and you are now controlling CueMix bus fader for that input. The LEDs are backlit, which can be especially helpful in dark studios or stage environments. From the factory, the bottons glow amber, except for the currently selected input or output, which glows bright green. BUT, there are other color schemes available. Just press and hold the METERs button for two seconds, and now it flashes. While flashing, push it repeatedly to cycle month six different color schemes, each with a different color for the inactive/active states. Different color combinations include green/amber, amber/green, red/amber, amber/red, red/green, green/red, etc. In each case, the active color is bright and the inactive color is dim.